Stanley is enjoying these frequent trips to Virginia - there are new paths to walk down, ones with completely different smells than the ones from home. 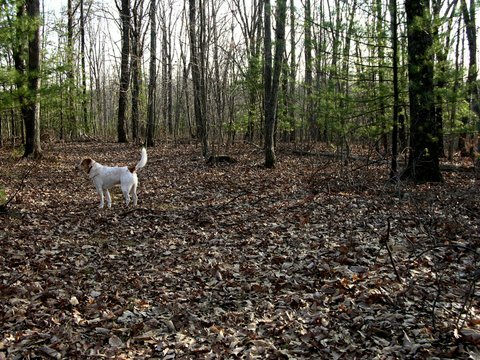 He watches, hoping to spot white-tail deer who frequent these same paths -- even though the only time we encountered a few, he froze up, his eyes got large and round - and I was grateful that he didn't run after them. From my parents home there are many wonderful roads with which one can chose to walk down - and for the most part, I let Stanley decide which way to go. I trust his judgement. It's nearing the end of a day that begin with spending several hours on the oncology floor of the Martha Jefferson Hospital. My mother's chest x-ray did not reveal good news, and for the remainder of the day we worked around the new reality, doing anything we could to cheer her up. Ultimately, life becomes quite simple: warm food, conversation, easy distractions, laughter. Anything for a bit of 'normal' when everything around you seems distorted. I'm glad that I was able to be here this weekend. So Stanley and I find our 'normal' outdoors, as is generally the case, walking down oak-leaf-covered old roads - new smells for Stanley, quiet for me. I'm sorry to hear your mother is not well, but glad you could be with family (and Stan) this weekend. Jodi, my mother was diagnosed with stage 3B lung cancer last March. It was quite a shock - she didn't have the typical risk factors, but is instead one of the increasing number of non-smoking women to come down with the disease. She's responded really well so far to treatment - we've been lucky, but I think we maybe at a difficult stage in the disease, where metastasis to places outside of the lung is likely. Like Daniel at "It's All Good", I don't have anything eloquent to say either...but I'm thinking of you and your family. Thank you Pat. That is perhaps all the eloquence that one really needs during such times.